McMurdo Modular 0.100″ edgecard connectors. Any number of contacts from 5 to 85 single sided, or 10 to 170 in dual row. These 2.54mm pitch modular connectors were originally designed to match the requirements of BS9526-N0001, N0002, N0003 and BT D2552. These legacy “Modular” edge card connectors are cut to the number of required contacts from an 85 way moulding and so have a continuous daughter board card slot. To prevent the daughter card moving axially out of the card slot the connectors can be mounted to the motherboard using metal or plastic end feet. When using plastic fittings a pair of cavities must be left empty at opposing ends of the body for them to clip into. The connector body is a green thermoplastic material, rated UL94 V-0 flammability. The McMurdo contacts can be fixed or replaceable, cantilever or bifurcated types designed for low insertion force and even pad pressure. Available from 5 to 85 way single or 10 to 170 way double sided the contact options include dip solder, solder eyelet and wire wrap; all in acid gold plated copper alloy. Polarising/location keys are available and can be purchased loose or factory fitted in specified positions. These connectors prove reliable replacements in fit, form and function to the sadly lamented Thermodata Components ‘Modulo’ and Viking Connectors UK ‘VMA Series’ of 2.54mm pitch Modular connectors and are intermateable with other similar pitch connectors and circuit boards.. Insulation Resistance initially: 1000 Mega Ohm min. Insulation Resistance after conditioning: 100 Mega Ohm min. Board insertion/withdrawal force:- 2.2 N max/0.2 N min per contact pair. These McMurdo “modular” connectors are very versatile with a choice of contact termination styles to give the user freedom of choice. 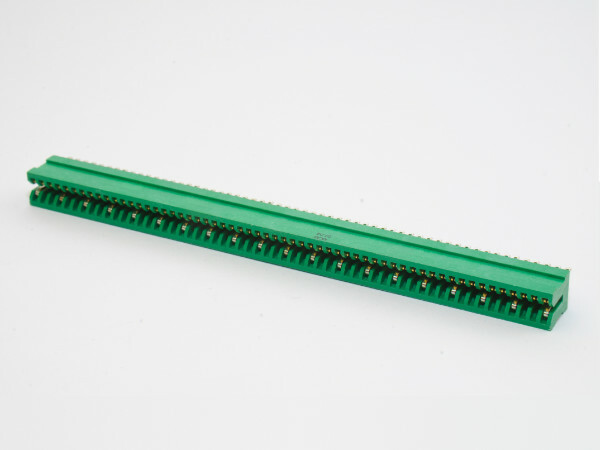 Except where otherwise stated in the data sheet, the modular connector is available in up to 85 ways single or double sided and the body moulding can be cut to any length. Contacts can be inserted only where they are needed to create custom connector layouts. Because of this, the McMurdo Edgecard can be used in just about any re-fit or replace scenario requiring an 0.100″ pitch in computer, test and instrumentation, control, broadcast sound desk, legacy arcade game, telecom etc. applications.